“Series creator Donald Glover stars with Brian Tyree Henry as cousins trying to pull their families out of poverty in the Georgia capital’s music scene … The premise is purposefully simple: ‘Two cousins work through the Atlanta music scene in order to better their lives and the lives of their families.’ … The vagueness is intentional because Atlanta is an existential comedy that works its most compelling magic by witnessing the everyday motions of life — scenes that have purpose but no apparent destination, because much of what Glover’s character, Earn Marks, yearns for in Atlanta is not to be poor. It’s really that simple.” — The Hollywood Reporter. “In Atlanta, Glover plays an Ivy League dropout haunted by his breaking of the promise of his prodigious academic career, living halfway in and out of a relationship with the mother of his child, dirt poor but needing the trappings of a middle class life. His cousin becomes a rising rapper and he becomes his manager – the pair can sense a way out of a poverty which will not easily release them. It’s shot through with a surreal humour, but also a biting realism and truly should not be missed.” — NZ Herald. 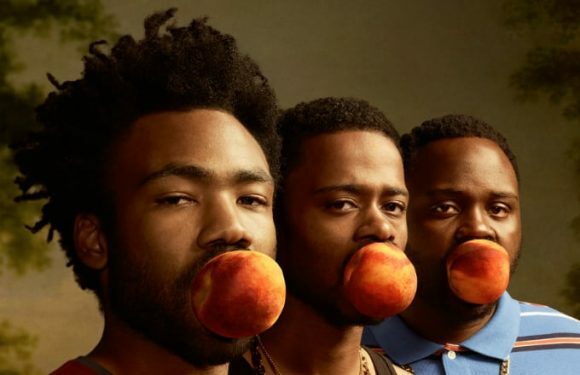 “Atlanta is laugh-out-loud funny, in a way that has the viewer cackling during a scene where the characters are totally silent. Unlike a sitcom full of punch lines, wordplay, and setups, Atlanta takes its time to build to its humour. But when it does get there, it’s hilarious … a finished, cinematic, and beautiful production that may be one of the best new shows of the fall.” — Variety. “Shot with confidence and cohesive style by director Hiro Murai, Atlanta tells darkly comic stories with a blend of realism, absurdity, and off-kilter framing that recalls early Tarantino … It’s an offbeat story about being young, poor, black, and desperate, and a satirical allegory about authenticity, art, and chasing fulfillment by living through others. It’s risky, it’s weird, and it’s one of the best new shows of the year.” — Entertainment Weekly. “Dry and offbeat, with an immediate, original voice, this comedy is a back-roads drive through the expansive territory between rags and riches … The story is a nod to how vast and global a business rap has become, a point that Empire has plated in gold. All the more reason it’s a delight to find Atlanta, an idiosyncratic hangout with a crew whose members, in a genre that lionizes making it big, would be glad to make it medium.” — New York Times.